Yesterday we were full at Four Villages Inn, so I asked people who booked to stay with us to go to a nearby guesthouse/hotel for one night until a room opened up for the rest of their four night stay in Kumasi. They agreed and spent the night at the other guesthouse/hotel. The next day I went to collect them, so I was there when they checked out. How surprised I was when the guests were issued with the guest house/ hotel’s own “official receipt” and not a government issued V.A.T. receipt! Needless to say the tourists did not know they were getting the wrong kind of receipt for their stay. I’ve always thought government should try to educate tourists on demanding an embossed VAT receipt to ensure the government gets the tax revenue. 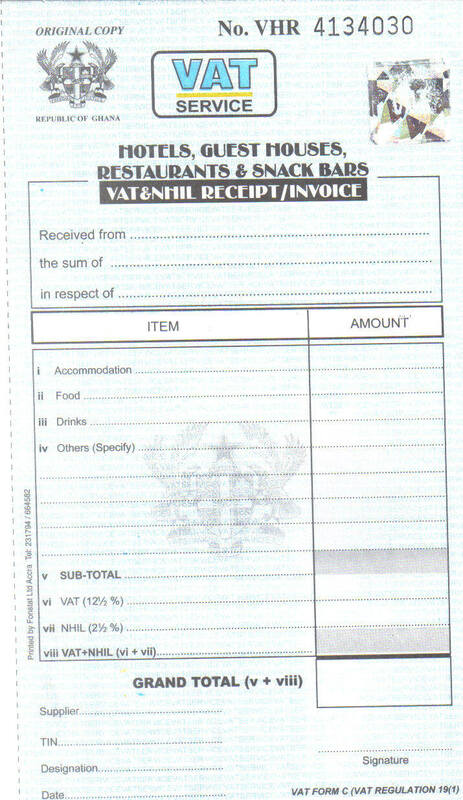 In the tourism sector you would think that tourists, foreign or domestic, would be issued a V.A.T receipt. However, most establishments quote their prices “tax inclusive” and thus have to take the money out of revenue received. We add on the VAT and thus our mind set is the tourist is paying, and not us! I remember raising this issue and making this argument at a Ghana Hotels Association meeting when VAT officials were addressing hoteliers and had opened the floor to discussion. Their reply, “This is Ghana”. Man, did I feel alone. This dude sure ain’t like minded…. Just how many times have I heard “This is Ghana” over the years….How about you? I feel passionate about this one…when daily ya see so much poverty and such desperate infrastructure and facilities. And I’ve felt like this for a long time too. Check out the FOUR VILLAGES INN web site (SEE TOP OF BLOGROLL), go to the VILLAGE NEWS and go to Edition 5 dated April 14, 2004 for an item entitled “Get your V.A.T. Receipt. Then go to Edition 6 of the Village News dated August 1, 2004 informing tourists of a new tax N.H.I.L (National Health Insurance Levy) of 2.5% bringing the total tax to be paid to 15% and the fact that our FVI rates do NOT include the two taxes. I’ll bring the situation to the notice of the manager of the guest house/hotel….and you are sure to get some follow-up.